After hearing about this “recipe” several times and seeing lots of rave reviews online I couldn’t wait to give it a try. It certainly couldn’t be easier, and I found it to be really tasty as well. If you’re on the Weight Watchers program, since fruit is now “free” this is also a zero point dessert! Make sure your bananas are ripe before freezing to get the sweetest flavor out of them. 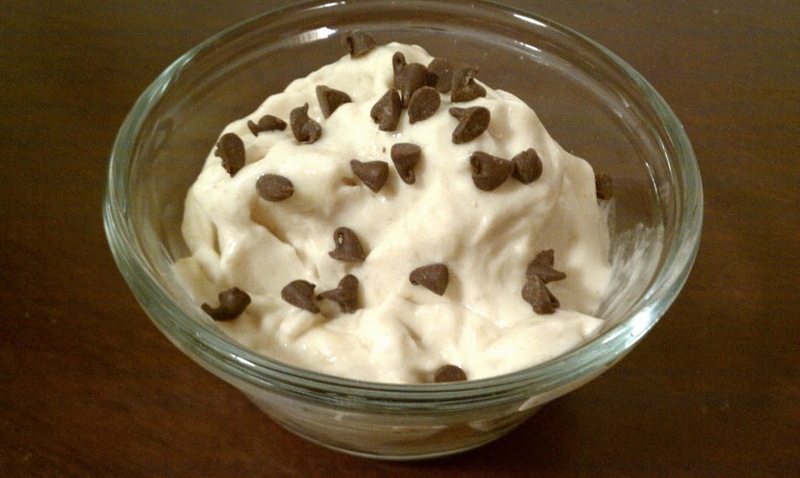 You can make as much or as little of this as you’d like at a time simply by using more or less frozen bananas, so it’s an easy dessert or snack to throw together for a group or just for one! The ice cream tasted great on its own, but if you want to jazz it up you can add any fun toppings you’d usually enjoy on ice cream for additional WW P+ (pictured above with 1 tsp mini chocolate chips). The ice cream is pictured without toppings at the end of the recipe. Enjoy! Chop up banana into bite sized pieces and put into an airtight Ziploc bag. Freeze banana pieces for at least 2 hours. 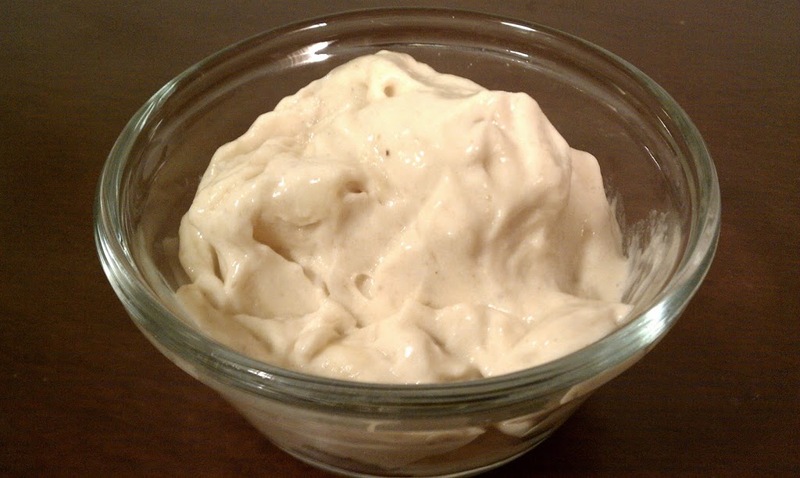 Once frozen, put banana pieces in a blender or food processor and blend until creamy. This is yummy on its own (and 0 WW points!) but it’s always fun to add toppings. I mixed in 1 tsp of mini chocolate chips and it was delicious. You could also top with chocolate syrup, melted dark chocolate, FF Reddiwhip, nuts, sprinkles, caramel, melted peanut butter or anything else you’d put on ice cream (all for additional WW P+). This looks so interesting and delicious – I’m hoping that your blog and great recipes are going to inspire me to get my own blog going w/ ww friendly recipes! You should! Blogging is a fun hobby and searching for new recipes is addicting. I love it and finding new and interesting dishes to try all the time makes it easy to stay on track. Good luck! I have plenty of well ripened bananas that I will be trying this with! Thanks for posting. I wasn’t sure what else I could use the bananas for other than banana nut bread… so not point friendly! This was very good. Love the creamy texture. I added the chocolate chips too! Ooh, that sounds delicious! Great idea. I added chocolate chips to mine too when I made this! So good! SO GOOD! I made this tonight for the first time and I added peanut butter chips. It was excellent! Made it tonight for the first time – my family of 4 ate 5 bananas! It really does have a consistency like ice cream! My kids added mini chocolate chips and chocolate syrup. Yum, glad it was a hit! …the bananas in the freezer right now! I can hardly wait to try this. I made this and it was really good! However I have a question, I had a really hard time getting it to work in the blender without having to dig out frequently from the blades. Do you have any suggestions on how to help that… or a good blender?! 🙂 Thanks for your blog, I’m enjoying all your recipes! Is the banana taste really strong? What an awesome idea! I can’t wait to try this! I can’t wait to try it! I was thinking of adding a little cocoa powder to the blending process….hmmmm…. I made this last week right after I found it on Pinterest!! I added a tablespoon of Greek Joghurt and it was delicious!! I couldn’t believe how creamy it was!! I was a huge desert addict en I finally found a desert that was right up my ally! This is such a treat and I can make it every day!! Yeah! I hope to find more recipes like these, cause I am a huge snack person!! Would you count this as a drink recipe? Is it still the same points in the new system? It sounds simple and delicious. If you blend the banana, it is not zero points. Freeze banana, mango and strawberries. Blend frozen fruit in a food processor, or Yonanas machine.